I've been a skeptic of the benefits that three-stream (commonly referred to as "450 Mbps") N can provide to folks looking for higher bandwidth for high-def video streaming. First, it doesn't appear that pairing three-stream routers with two-stream clients provides consistent performance improvement, as shown by my TRENDnet TEW-691GR multi-location performance testing. Second, three-stream throughput testing of the TEW-691GR and D-Link DIR-665 with an admittedly jury-rigged three-stream client showed higher throughput variation than seen with even the worst two-stream N products. And finally, three-stream clients have been available only in notebooks and laptops, which doesn't help folks looking to try three-stream N to connect to media players, media PCs and PS3s and Xbox360s used as media players. Last month's CES, however, revealed one solution to address the last issue, which is the subject of this review:TRENDnet's TEW-687GA 450Mbps Wireless N Gaming Adapter (I wish manufacturers would all call these things what they are: bridges). 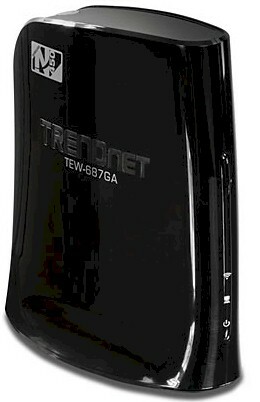 The 687GA looks like its "300 Mbps" sibling, TRENDnet's TEW-647GA. Both have curvy glossy black plastic cases designed to sit on a desk or table. Thermal design isn't the greatest, with only two rows of narrow perforations on the top side. The air intake vents are generous, but are on the bottom of the case with slim rubber feet raising those intake vents only 1/16" or so. So if you're concerned about heat, get some thicker stick-on feet and slap 'em on. The front of the bridge has power and wireless and wired link / activity lights and there is a WPS pushbutton on top (Figure 1). The rear panel has a power port and 10/100/1000 Ethernet port and you'll see a hole on the bottom of the 687GA for the recessed factory default reset switch (Figure 2). Figure 3 is an FCC doc photo (FCC ID XU8TEW687GA) of the inside. You can see three printed circuit antennas arrayed at the front, top and rear of the bridge. The three white patches at the top are covers for the RF shields. Note the antenna connectors (Hirose U.FL, I think) that are probably for manufacturing test purposes. The closer view in Figure 4 reveals a few component details. You can see the components in the RF "cans", but not the actual part numbers. I'm guessing they're 2.4 GHz power amplifiers, perhaps SiGE SE2528L. You can make out the main device, the same dual-band Ralink RT3883F 802.11n 2.4/5GHz 3T3R 450/450Mbps Single Chip AP/Router SoC used in the TEW-691GR router. I had to pop the top to get the rest of the component details, which include a Realtek RTL8211CL Integrated 10/100/1000 Gigabit Ethernet Transceiver, W9725G6JB 32 MB Winbond RAM and 4 MB Macronix flash (29LV320). Like the TEW-691GR, the 687GA is single-band only, even though it uses a dual-band device, for the same reason. The 687GA also lacks the RF circuitry to support 5 GHz band use. I'd probably feel better about long term reliability if TRENDnet had chosen to slap some sort of heatsink on the main RT3883F device. But low cost, not reliability, is usually TRENDnet's priority.